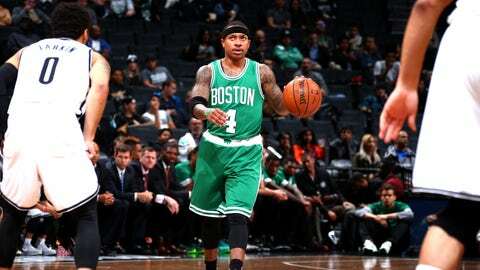 Isaiah Thomas and Amir Johnson were an unstoppable combination in Brooklyn on Wednesday night. The Boston Celtics defeated the Brooklyn Nets 109-105 on Wednesday night, but the final score makes things look more competitive than they really were. Brooklyn never led, while Boston's largest lead was 18 points. Why? Well, the Nets had no answer for Isaiah Thomas and Amir Johnson, Boston's two best players. The duo combined to score 36 points in 48 minutes, and both made over 60 percent of their field goal attempts. The Celtics offense wasn't great last season, but with these two in the mix from day one, there's a good chance they're much more efficient this year.